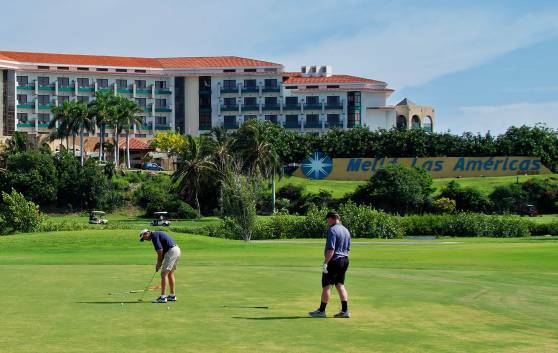 Best golf vacations at Melia Las Americas hotel in Varadero Cuba. Meliá Las Américas offers customers a unique golf program in Cuba. Golf groups will be entitled to personalized check- and welcomed by the golf coordinator based in the hotel lobby. Every Thursday, a mini-tournament will be held on the putting green in front of the stunning Xanadu mansion, organized by our charismatic entertainer, Julito. Winners will receive Cuban souvenirs. Meliá Las Américas is famous for being the only hotel in Varadero with direct access to the golf course, located just 150 m from the hotel lobby. Every year, from May 1st through October 31st, golfers accommodated in the hotel will be entitled to unlimited green fee, as part of the package. Juicy discounts will also be available the rest of the year.